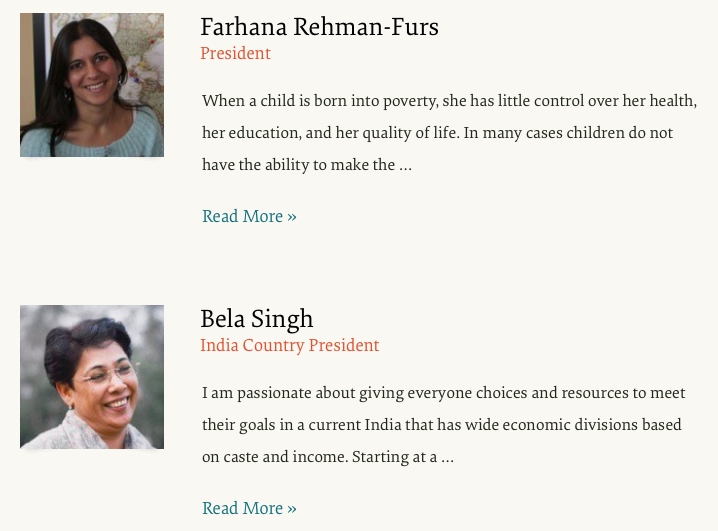 If we want compelling staff bios on our nonprofit website, most of us are going to have to do a little work. If you’ve spent any time in the world of nonprofit copywriting, you’ll have heard the maxim: people give to people, not causes. We like people. We care about real people, because they remind us of those we love and care about. Ourselves, our friends, our kids and our communities. But many nonprofits forget that the same applies to our own organizations as well, not just our fundraising materials. We’re in the relationship business. Major gifts fundraisers—how much time do you spend getting to know your donors? Then it makes sense to let your donors get to know you too! Bio page from Cross-Cultural Solutions – short and sweet bio, and you can click for more. 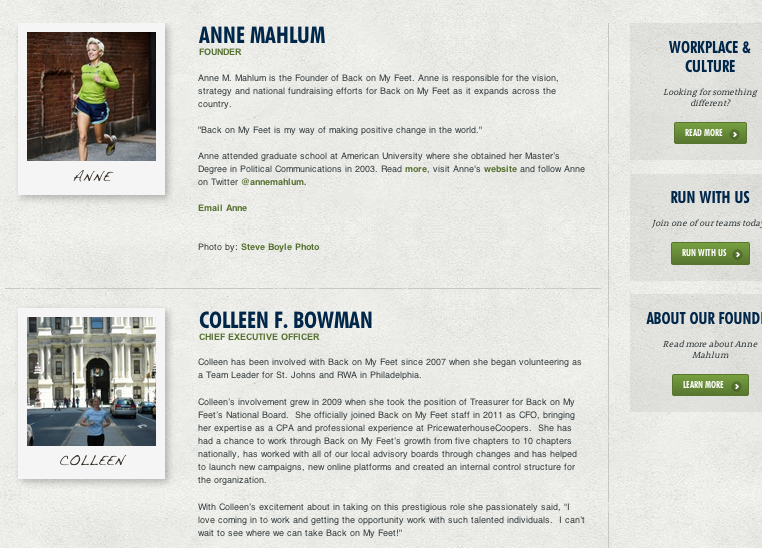 One of the cardinal sins of nonprofit staff pages is not having a bio for your staff members at all. It’s not enough to have a contact number and email, or a name. Stopping there would be very corporate—and not in a good way. Don’t put up a wall between people and get them to stop thinking of you not as a real, breathing person who cares about the world. You don’t want to be a name and a job title. Plus, subconsciously, you’ll communicate the same thing about your donors: they aren’t real, dynamic people. They’re just anonymous billfolds, like you’re an anonymous suit. So what should you put in your bio? Good question. Keep reading. 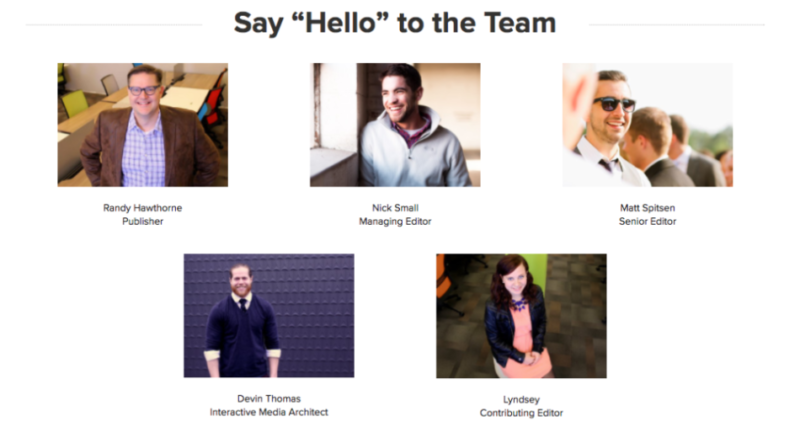 Your very own, non-boring, Nonprofit Hub team’s about page. Aww, yeah. Ok, here’s the one exception to the rule of always having a biography: if your biography is boring, kill it. You might as well select your bio text, hit DELETE and click SAVE. Trying to be impressive to funders: We worry that grant-givers don’t give to organizations that are not professional and serious about what they do. So we stuff all of our biggest, most boring achievements in our biographies. Believe me, if funders aren’t sure about giving to your organization, your impressive biography is not going to sway them. Trying to be impressive to individual donors: Ok, when individual donors click on your about page they care about two things. A) Whether you are run by real people, and B) If you are the kind of people she would be friends with. If you have staff bios at all, you pass Test A. And if you’re not boring, you pass Test B. There is no Test C for whether you’re impressive. Individual donors don’t care about your job title. They won’t remember it in 10 minutes. Trying to impress our bosses: Your bosses are neither your donors or funders. Send them to this article if they want you to have boring bios (they probably don’t). Wanting to feel impressive to yourself: You aren’t your donors or your funders, either. You are special. You don’t need to brag to know that. Trying to fill space: We have a hard time talking about ourselves, sometimes. So we put all the obvious boring stuff in our biographies to fill space. Stop and just be normal! See “Have a Personality” below. Not having to try too hard: It’s really easy to write your job title and how many years you’ve been in the organization and where you went to school. Stop being lazy. Thank goodness. Now that you know there are no rewards for being boring, you can stop! Feels good to be interesting, doesn’t it? Sweet, sweet liberation. Back on My Feet’s bio page pictures are polaroid-esque photos that incorporate the running theme into them. Awesome job. First, too many people don’t have a picture at all. This is a huge mistake. Why don’t you have a picture? People like pictures. 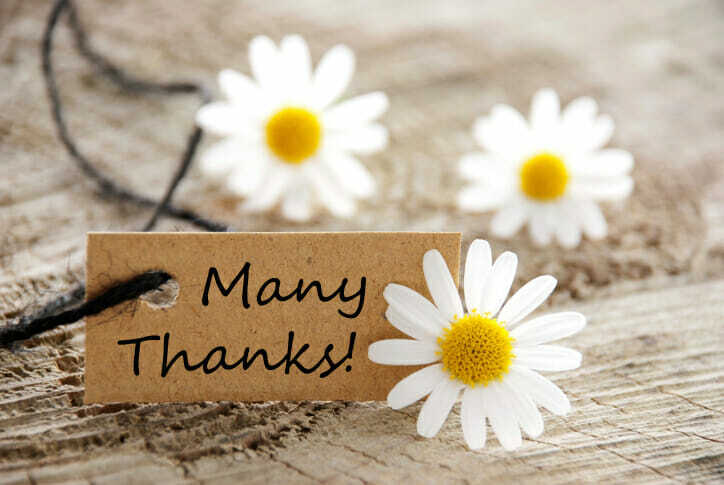 Today, we’re spoiled by visual social media like Facebook and Pinterest. If you have a picture, people are much more likely to believe you exist, and to feel connected to you. Secondly, make sure your picture isn’t terrible. Take the time to pull out a smartphone, have someone who understands photography just a little bit take the photo and then upload it to your website. Most of us walk around with little high-resolution cameras in our pockets, so you’re out of excuses for not having a photo of yourself on your website. 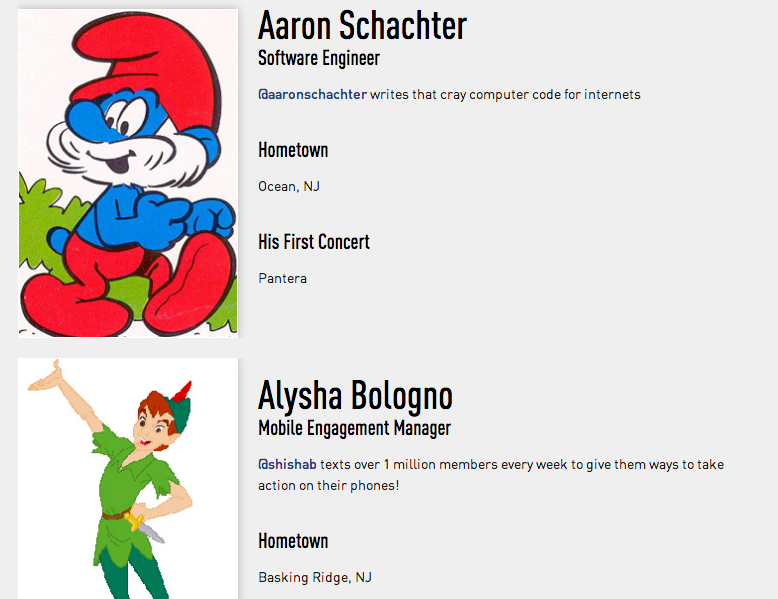 DoSomething.org’s bio pages have personality that matches their target demographic’s sensibilities, as younger kids. Again, people only want a couple things of your staff biographies: they want to know you’re real and that you’re someone they wouldn’t hate to be associated with. This is a really low bar! You can do it if you have a little personality. Why are you in nonprofit work? What emotional reasons? We want to connect with real people, so be unapologetically real. Err on the side of too much personality. It’s way better to be a little weird and remembered than being boring, safe… and totally ignored. Allison provides administrative support to the Capacity Building Services team. Allison is a native Oregonian and has worked in the nonprofit community in Portland as an Office Manager and Program Coordinator for the last six years. She received a BA in Community Development from Portland State University with a focus in community organization and change. 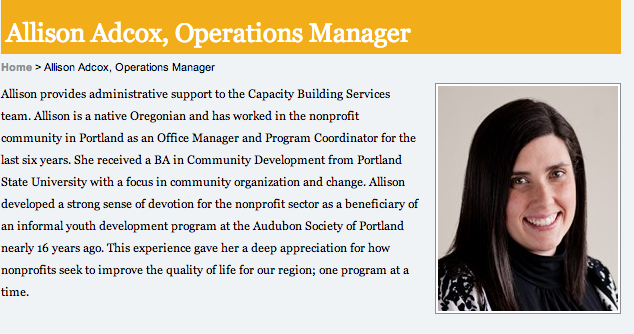 Allison developed a strong sense of devotion for the nonprofit sector as a beneficiary of an informal youth development program at the Audubon Society of Portland nearly 16 years ago. This experience gave her a deep appreciation for how nonprofits seek to improve the quality of life for our region; one program at a time. Allison’s bio is 110 words long—a great length. It’s got a great picture. The one problem: the bio could use more personality. A native Oregonian, Allison fell in love with nonprofits when she was only a teenager. Inspired at a summer camp led by the Audubon Society of Portland, Allison quickly developed a deep passion for charitable work. This resolve stuck with her through college, leading her to get her BA in Community Development from Portland State U. Over 16 years later, Allison provides support to our Capacity Building Services team and is happy spending her days keeping Oregon an amazing place to live, one program at a time. The bio could still be more fun (what does Allison love about Oregon? It’s lush state parks? Hiking? Kayaking? The open skies? )—but it feels fresher already! Not too difficult, right? 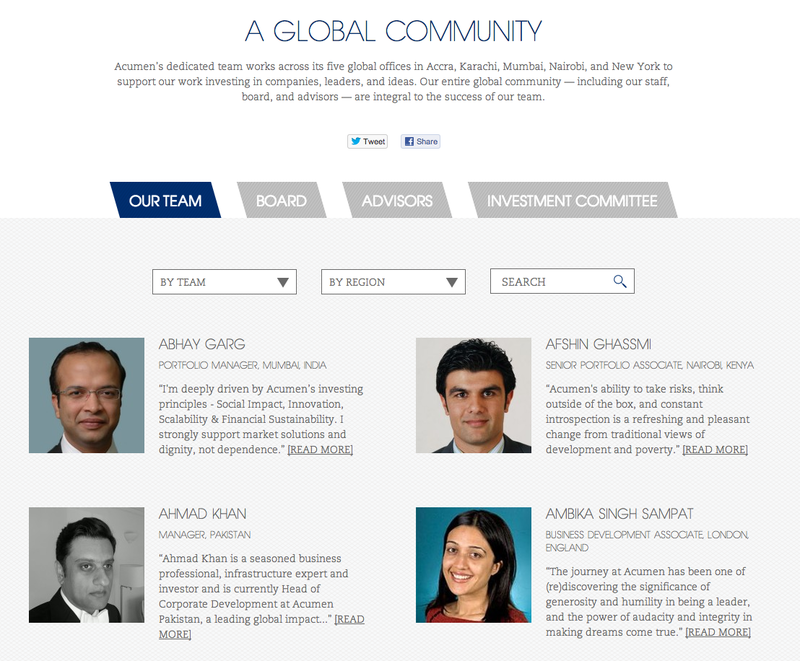 Acumen Fund’s bio page—loving the quotes. Very personable. Your bio page is a great time to practice your nonprofit storytelling. In the nonprofit world, literally every time you answer the question “So what do you do?” you’re given a chance to tell a story about what you do and why your work matters. Your answer is fundraising 101, and it should be fun! For example, if in your bio you mention your education, make it part of your story! Don’t just drop it for no reason. More story tips: Ask yourself, why are you involved in this work? What about your life experiences makes it matter so much to you? (Don’t just say “because my cause is important”—that’s lazy. Say why it’s important to you individually.) 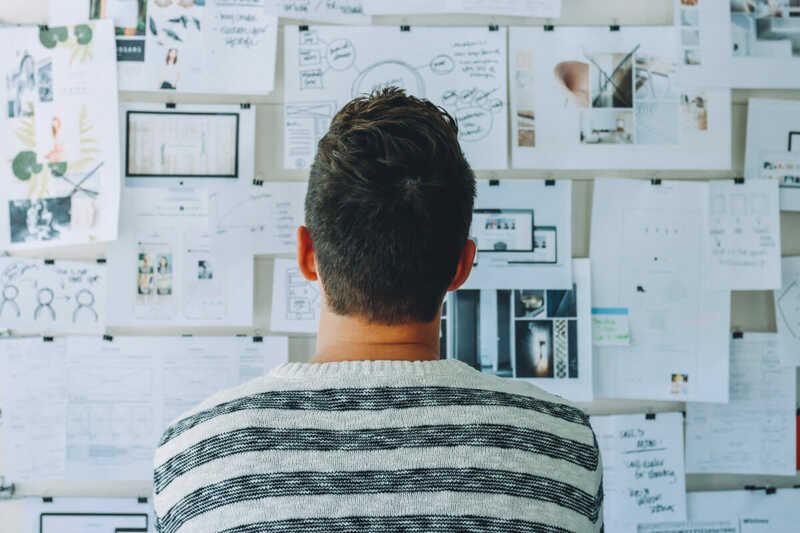 It’s likely your motivations are similar to potential donors’ own motivations, so it’s a great chance to connect on a deeper level. 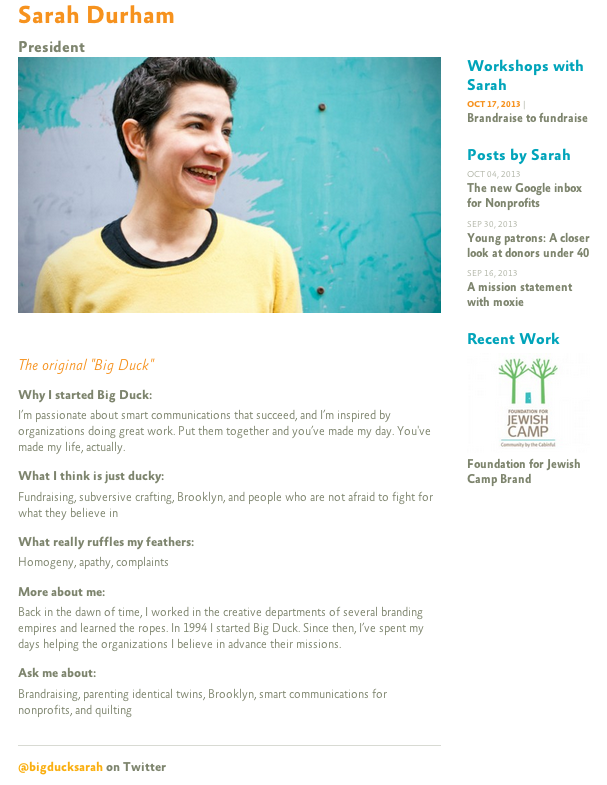 Sarah Durham, one of our favorite nonprofit thought leaders. So many good things about this bio page, but note—you can reach out to her on Twitter! Hurrah! Finally, make sure there’s a way to contact each staff member. This can be a phone number, personal email or even your Twitter handle. Just make sure there’s a way that folks can reach out to you and connect. You’re in the relationship business, after all—connection is what it’s all about. Remember, people give to people. People connect with people. Always make your communications more personal, more genuine and more human, and you’ll never go wrong. NextDoes Your Organization Have “Solid Performers” or Rock Stars?